My husband and my friend's husband, tried the Expedition Everest at Disney World. I don't think I would be able to handle this kind of ride wahhh. My daughter on the other hand, really wanted to try it but her height prevented her to. Thanks to sis Dhemz for taking the first photo. She took the picture above while I was taking the two photos below. "Expedition Everest is often compared to the 1959 Matterhorn Bobsleds roller coaster at Disneyland, which also features a snowy mountain setting and an "abominable snowman" figure throughout the ride. 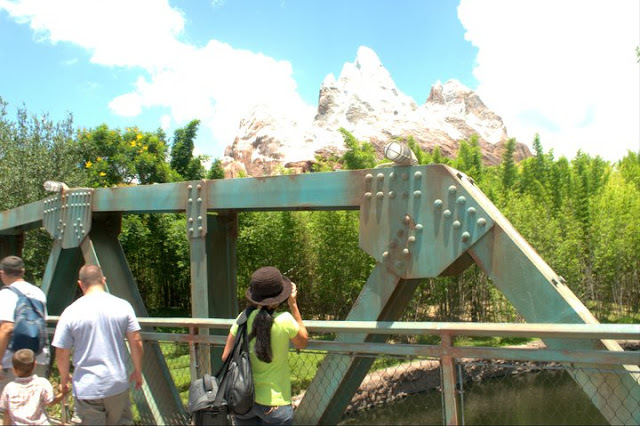 Expedition Everest is the tallest of the artificial mountains at Walt Disney World Resort, joining Big Thunder Mountain Railroad, Mount Gushmore, Space Mountain, Splash Mountain and Mount Mayday on the list of Disney-built peaks. According to Imagineering, it is Disney's 18th mountain-themed attraction." We wish to go back in Disney World in the future. If we could find a Cheap Flight to Florida for all of us, then it would be possible. Traveling is one of the many things that my family love to do. Ha, I think I could handle climbing this Mt Everest. Cute post and photos. Ate Rose, sama mo kami pag nakakuha ka ng cheap flight. Hahaha! Hi Rose! Ano cam gamit mo? Ang ganda talaga nung pics nyo. Very vivid. Love those photos! The place is super nice, too. The mountains look so real! Many years ago, I rode the coaster in Space Mountain - exciting does not begin to describe that ride! Wow! Such fun for the children...Except of course when they are too short for the rides they wish to go on. Phooey. Luckily they always grow!! Happy SSS, Rose. looks like a fun time was had by all!!! Visiting you for Happiness Is :) Thanks again for joining! Great shadows on the theatre building! Your family must have had a great time! By the way, I didn't go on the Space Mountain ride with Ralph. That is a family fun place to go. I never will be on another ride. The last one, I thought my time had come. I like those ominous shadows at the mouth of the "mountain." Stunning Disneyworld scenes! And love the shadow patterns across the theatre facade! Makes it seem like a mysterious, enchanting entrance! Looks like FUN! Why don't you link your post to Seasonal Sundays? That ride would be too much for me, too! Nice family photo at the end! beautiful traveler family and lovely pictures too Sis :-) Visiting from Happiness is...hope that you can return the visit too. so cool family! Sharing to you My Happiness is...#6.